North Carolina passed a law in 2007 called the Renewable Energy and Energy Efficiency Portfolio Standard (REPS), which requires power utilities to get certain percentages of their energy from "renewable energy resources or energy efficiency measures." 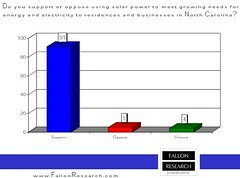 To that NC added frequent, detailed, public reporting, and thus enabled a renewable energy industry. "Beginning in 2009, each power supplier is required to file a compliance report, detailing the actions it has taken to fulfill the requirements of the REPS."
"The passage of the REPS law in 2007 and resulting success of the North Carolina's clean energy market has created the rapid start-ups and expansions of clean energy businesses from installers to developers to manufacturers and the associated service sectors over the last few years." There was some demand, and there were technical solutions available, but not widely used. The legislature didn't just decide spontaneously to pass REC: NCSEA and others lobbied for a reporting system and got it. NCSEA uses REC data to compile an annual book comparing wind, solar, biomass, nuclear, coal, natural gas, etc., in detail, throughout the state. This let people who had only previously heard about solar in places like Germany and New Jersey see how it was working in their own state and county. That enabled constituency building, leading to the 91% favorable rating for solar energy, which makes solar provision a strong reputational factor for utilities. In addition to renewable energy system architecting, transport, installation, and maintenance, 56% of solar jobs in North Carolina are in R&D. REC data let NCSEA and others study the entire solar ecosystem.